In the 1770s Johann Christian Bach may have been among the most successful and prosperous musicians in all of Europe. 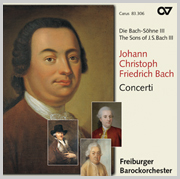 In the 18th century the youngest son of Bach was regarded as the most famous and successful members of the Bach family. However, it appears his reputation faded even during his lifetime – today he is known by many only as a forerunner of Mozart. 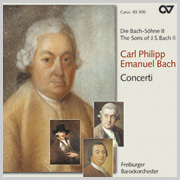 The new recording of five of his orchestral works, a sequel in the Carus CD series with instrumental music of Bach’s sons, shows that his music has been unjustly forgotten and that definitely it breathes its own independent spirit. Similar to Mozart, the “Milan Bach,” later known as the “London Bach” knew how to pour his varied musical experiences into his works and thus achieve his own unique style. Johann Christian Bach preferred colorful instrumentation in his compositions and he experimented with different solo instruments. His works are characterized by noble elegance and the cantabile style of the Italian opera aria. Later generations of musicians accused Bach of making composition too easy. The present recording shows most clearly that on this CD every piece is an inspired, original work of great music. These are brilliant pieces that showcase the musical trademarks of the Freiburger Barockorchester –outstanding artistic level of performance, joy in experimentation, and a passion for playing – which here are once again realized to the highest degree. 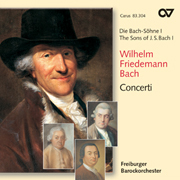 [...] An der glänzenden Einspielung dieser CD durch das Freiburger Barockorchester hätten Johann Christian und Wolfgang Amadeus sicher ihre gemeinsame Freude! [...] Die Auswahl aus einem großen Schaffen des nur 46 Jahre alt gewordenen Komponisten macht Lust, mehr kennen zu lernen von einem, der zu Lebzeiten höchste Anerkennung und Bewunderung erfuhr, nicht zuletzt durch Wolfgang Amadeus Mozart, der dessen Musik schon als Kind kennen lernen konnte. [...] Freiburger Barockorchester spielt auf historischen Instrumenten - in einer Weise, dass es natürlich klingt. Klangexperimente gehören da mit hinein. Immer aber ist den Musikern wichtig, nahe am Original zu bleiben, zu forschen und im Sinne des Komponisten dessen Vorstellungen zu verwirklichen. 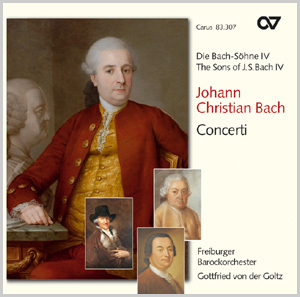 Ich wünsche mir eine Fortsetzung, eine weitere CD mit Entdeckungen von Johann Christian Bach! [...] Nach dieser CD ahnt man, warum Mozart so für den jüngsten der Bach-Söhne schwärmte: Der rauschhafte Allegro-Schwung, wie ihn die Freiburger entfachen, dürfte es ihm angetan haben.